Consumer product toxicology evaluations involve a wide range of chemical and biological compounds. With respect to toxicity, the manner in which consumer products are used can be just as important as the chemicals in the products. For example, ammonia and chlorine bleach are common in most households but, if combined, will produce chloramine gas with potential pulmonary toxicity. Unintentional exposure to toxic gases (such as carbon monoxide from a faulty heater) can also cause significant adverse health effects or even death. Similarly, most plastics are considered to be non-toxic; however, certain plastics (such as vinyl) can release lethal hydrogen cyanide (HCN) vapors as a result of pyrolysis or combustion. Thus, the circumstances of exposure may have toxicological relevance greater than the product's composition. This is often a key point in cases involving causation and/or liability. 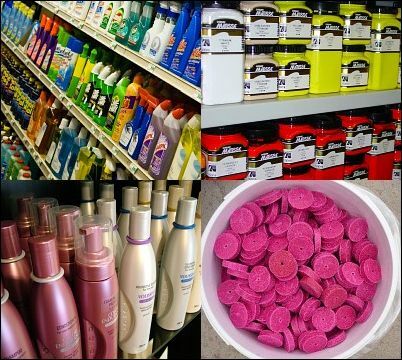 Our toxicological experience assessing the health effects of consumer products covers a wide range of product types including cleaning and janitorial chemicals, cosmetic products, hair and beauty products, herbal products, poison baits, combustion devices and dozens of others. The following describes a few areas for which TCAS has been regularly retained for expert consultations and assessments. Please contact our office for information concerning any type of consumer product not shown here. Show all results for "Cleaning and Janitorial Chemicals"
Cleaning chemicals have a wide range of toxicological properties that are well-documented with appropriate warnings based on composition and chemical interactions with one another and the environment. Acidic washing agents contain strong mineral acids, surfactants, corrosion inhibitors and chelants which remove inorganic deposits and scaling. Examples include muriatic acid (for cleaning concrete, swimming pools, etc. ), vinegar (for removing calcium deposits) and sulfuric acid (for dissolving proteins, greases amd organic substances). Alkaline cleaners typically contain sodium hydroxide, potassium hydroxide, bleach, ammonia and other alkalis. These are designed to dissolve oils, fats, grease and protein-based deposits. Neutral substances are pH-neutral, non-ionic surfactants which dislodge and disperse dirt. Degreasers are solvent-based compounds primarily designed to dissolve grease and other petroleum-based substances. As these chemicals can all be ingested, absorbed or inhaled, there are many well-documented toxicological endpoints associated with both short- and long-term exposures. TCAS has significant experience assessing cleaning and janitorial chemical exposures. A recent exposure case in our toxicological case studies illustrates how a plaintiff's claims of damage resulting from exposure to a chemical stripping agent were disproven when Dr. Sawyer validated her claims against her medical history and assesed the toxicological factors. (Dr. Sawyer was retained by defendant in this instance). Show all results for "Cosmetic Products"
Cosmetic products (including hair and beauty products) are generally either consumer oriented or applied professionally on a commercial basis. The distinction is sometimes vague but in general, commercial products tend to have greater toxic potential due to increased concentrations of certain chemicals and additives. For example, although "home permanent" chemicals are far more diluted than those applied commercially by hair-care professionals, both have toxic immunological potential. Similarly, some cosmetic products for consumers can induce a wide range of toxicological reactions depending on the chemical compounds present, individual sensitivities, etc. It should be noted that with few exceptions, the Federal Food, Drug, and Cosmetic Act does not require cosmetic products and ingredients to be approved by the FDA before they go on the market. Rather, the FDA has consistently advised manufacturers to use "whatever testing is necessary" to ensure the safety of their products and ingredients. This methodology constitutes a somewhat loose set of standards but regulatory initiatives are increasing. The U.S. EPA recently issued guidance1 concerning the safety of nanomaterials in cosmetic products which can have chemical, physical, biological and toxicological properties quite different from their larger counterparts. Thus, cosmetic products constitute a class of consumer goods in which the technology is evolving exponentially. In keeping with U.S. FDA regulations, TCAS evaluates cosmetics and consumer products by relying upon standardized testing with internationally-recognized procedures known as the "Globally Harmonized System of Classification and Labeling of Chemicals" (GHS). Additionally, TCAS keeps current and reliant upon the epidemiological and toxicological literature with respect to this complex class of products. This is a necessary prerequisite to producing an objective, scientifically credible assessment. TCAS has conducted numerous such assessments and provided expert testimony concerning many cosmetic, hair and beauty products. Please contact our office for additional information. Show all results for "Herbal Products"
The fact that herbal products are not subjected to the rigorous testing of conventional pharmaceuticals and the fact that the availability of certain products varies widely by geographical region has a significant impact on conducting a toxicological assessment. For example, TCAS has had extensive experience assessing the adverse health effects of a herbal product banned in Europe and much of the rest of the world, but still available for purchase in the U.S. This product is strongly associated with fulminent hepatic (liver) failure and is documented with numerous studies in the peer-reviewed toxicological literature. However, there are no formal U.S. regulatory standards covering this particular product as it is classified as a "dietary supplement." Thus, when assessing the toxicological impacts of herbal products, the expert toxicologist must draw upon a comparatively-smaller base of information while simultaneously considering multiple exposure factors. A typical case involves a process of investigative research into reliable case history studies as well as peer-reviewed studies, on-going epidemiological research and the available body of toxicological literature to produce a scientifically credible and reliable assessment. Please contact our office for additional information. Show all results for "Pesticides and Poison Baits"
Poison baits are a class of pesticides most commonly used to control rodents and varmints. Although many products have been on the market for decades, new products are regularly emerging and regulations governing their use are becoming more stringent. For example, U.S. EPA recently took action3 to remove 12 D-Con™ brand mouse and rat poison products from the consumer market as they failed to comply with required safety measures to protect children, pets and wildlife from accidental exposure to rodent baits. The active ingredients (brodifacoum, bromadiolone, difethialone and difenacoum) are very toxic and persistent and have been found widely in non-targeted wildlife.4 Baits containing chlorophacinone, diphacinone, warfarin, cholecalciferol and bromethalin are less toxic, but any rodent bait has the potential to harm non-targeted wildlife. Recent regulatory changes imposed on poison bait products containing persistent pesticide ingredients (previously marketed to residential consumers) are now available only for commercial use by licensed professionals. TCAS has significant experience in assessing and solving homicide matters and assessing the toxic health effects of pesticides and poison baits, as well as providing written reports and expert testimony in accordance with federal, state and local regulations. A recent pesticide exposure case in our toxicological case studies summarizes the events relating to the death of a man with a history of seizure disorder who was fatally exposed to pesticides in his unventilated basement apartment. (Dr. Sawyer was retained by plaintiff in this instance). "Consumer product toxicology encompasses a wide scope of substances which impose challenging assessment requirements. Objective weight-of-evidence procedures must be applied to establish or refute causation to reasonable toxicological certainty."